In his acclaimed book "Encyclopedia of Chess Variant" (first edition), D.B.Pritchard presented the rules of a "Cambodian Chess" game having unknown origins and displaying elements at the crossing of Western Chess (like Indian Chess and Thai Makruk) and Oriental Chess like Xiangqi. The source is P.A.Hill. On the other hand, there is a page on the Web, signed by Vuthy Tan, a Cambodian at the time living at Portland, Oregon which describes the Ouk Chatrang, the Chess variety which is popular in Cambodia, with plenty of precious details. It appears that this game is almost identical to the Makruk played in Thailand. (This page has disapeared, fortunatelly this is the Mirror page: Cambodian Chess Games by Vuthy Tan). Then we are facing an enigma: if the Ouk Chatrang is genuine Cambodian Chess, what is Hill's Chess exactly ? Pritchard presents the Hill's game as "an old variant displaying elements of Burmese Chess, Chaturanga and Makruk". This definition could certainly have been applied to the real Ouk Chatrang but not at all to the game is presenting ! Actually, the Hill's game appears to be a sort of hybrid between Xiangqi and Makruk rather and nobody can tell why it is supposed to be old. Here the rules given by Pritchard according to Hill's details. 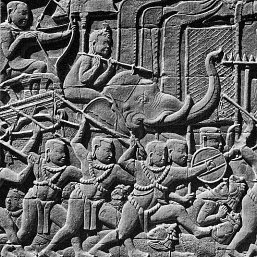 Each side has 18 men: 1 King, 2 Boat, Elephant, Horse, Official, 9 Fish. The array is displayed above. The pieces are figurines, the pawns are disks. The board is an 8x8 uncheckered but play is on the intersections (9x9). The Boat moves as the orthochess Rook. The Elephant moves as a King but cannot capture in the 3 backward directions. The Official is the old Queen (or Fers): moves 1 square diagonally, but can only capture in the 2 forward directions. The Fish moves and captures 1 square straight forward but when it crosses the centre line (on its second move) it is reversed and thereafter moves as a King. From the Makruk, one finds the King, the Horse, the full line of Pawns in an advanced position and the uncheckered 8x8 board. The Rook is common to all Chess game, Xianqi included, but the name of Boat is from Makruk. From Xiangqi, one finds the play on intersections, the first line of 9 pieces. The Fish (=Pawn) and its promotion is very original although inspired by Xiangqi. The Official is original although inspired by its counterpart which is identical in Makruk and Xiangqi. Then, this game looks like a puzzling hybrid. Were it be true, it would be a very important stone in the history of Chess, being a bridge between Western and Oriental games. The following information has been given to me by Peter Michaelsen. He forwarded me an e-mail from Philip Cohen who had a correspondance with late John Gollon, the author of "Chess Variations: Ancient, Regional, and Modern". D.B.Pritchard is referring to the same correspondance. John Gollon said that he had received in 1969 from an U.S. serviceman (P.A.Hill ? ), who had served as an interrogator in Saïgon, the description of a variation of Chess which he obtained details from a Cambodian born guerilla officier he was questioning. In addition to the information already given above, this correspondance gives the names of the pieces : Chhwie (King), Ta Hien (Official), Tam Mai (Elephant), Sheh (Horse), Tuk (Boat), Trei (Fish). We learn that the Fishes are irregular disks marked differently on either side so pieces which have crossed the center line and have been flipped can be distinguished. John Gollon commented : "At the time, I boiled over with enthusiasm about this ackward (backward? awkward?) little game, viewing it as either a link between the Chaturanga and Chinese Chess forms, or as a blend resulting from the meeting of the two traditions (Thaï and Burmese Chess, say, still are more closely linked to Chaturanga-like games, while Chinese Chess is the chess of Vietnam)...The correspondent later expressed some concern that he may have been mistaken in some details. I have never been able to check with an official Cambodian source. So there could be some errors - then again, perhaps there are none." So what is it exactly ? Most probably an invention, a very cleaver invention from someone knowing very well Chess and all its Asian varieties. Moreover, the game seems very playable. So, what is it ? Hey, Mr Gollon wasn't it a joke you left for your followers ? Well done ! "Now, as for John's personality...insofar as I may speak for him, I can say with fair certitude that he would not have intentionally invented or deliberately allowed an inaccuracy to exist solely to be found later by fact-finders. This I base on my experience of him as a perfectionist of a high caliber (he would start nothing, not even watch a movie, if he could not finish it) and as a scholar with particular integrity in general. Though he was possesed of a singular sense of humor, I doubt seriously that he would have let that spill over into his book. We will never know, true, but this would be my guess--very likely, the P.A. Hill (yes?) that he received the variation from is the key to the matter. I hope I can persuade you on this issue, simply because I just don't think he'd consciously have done it, much like the artist who refuses to put hidden tracks in his album. If he had invented any chess variant, he would have wanted it to be accredited as such." The best is probably to respect this evidence from someone who did know John Gollon very well. An article has been written in Variant Chess magazine n°55 (Sept. 2007), dealing with this strange so-called Cambodian Chess. Available here. Or here. There, John Beasley, who completed and edited David Pritchard's "The Classified Encyclopedia of Chess Variants", apologizes for having assessed that this version of Cambodian Chess was doubtful because lying on a single, not confirmed, evidence. Peter Blommers told him that he possesses a photograph of a set and that this game was several times reported by a Japanese collector, Okano Shin, in various books or exhibition booklets. The board bears both diagonals crossed, like in Sit-tu-yin (Burmese Chess). The Elephant moves as a King but cannot capture in the 3 backward directions and the 2 sideways. The name of the pieces are: Kwon (King), Neamahn (Official), Kwos (Elephant), Seh (Horse), Tuuk (Boat), Trai (Fish). So, maybe this game had some true existence. This information has been repeated in Variant Chess n°64 in August 2010. I had the chance to be in copy of several exchanges of e-mails between several Chess researchers in Europe (Peter Michaelsen, Peter Blommers, John Beasley) and in Japan. The help of Yasuji Shimizu has been instrumental to clear out the new elements published in 2007 and 2010. The situation has been summarized by John Beasley on his website. To avoid any loss, this is the summary he made. I fully agree with his conclusions. In the first edition (1994) of The Encyclopedia of Chess Variants, David Pritchard described a chess game allegedly played in Cambodia. His authority was a copy, now in the Pritchard archive in the Musée Suisse du Jeu, of a letter written by the late John Gollon to Philip Cohen, reporting information he had received in 1969 from a U.S. serviceman serving as an interrogator in Saigon, who in turn had received it from a Cambodian-born guerrilla officer he was questioning. The name 'P. A. Hill' had been added as a manuscript annotation to the words 'U.S. serviceman'. However, this description was challenged, and in The Classified Encyclopedia of Chess Variants (2007) I took it upon myself to omit the game from the main text and to mention it only in an editorial note, with the comment that the authority for its existence appeared to reduce to a single informant whose statements were at variance with all other known testimony. There have since been several developments. Immediately upon publication of the Classified Encyclopedia, I received a letter from Peter Blommers saying No, there was indeed supporting testimony; the Japanese collector Okano Shin possessed a set, and he himself had a photograph of one. He subsequently sent me photocopies of pages from several books in Japanese, by Umebayashi Isao and Okano Shin or by Okano Shin alone, with translations into English of the relevant items. There were minor differences between the games described by Hill and by Umebayashi Isao and Okano Shin as translated (the names of some of the pieces were quite different, there was a slight difference in the elephant's capturing power, and the board in the photograph had diagonal lines across it in the manner of Myanmar chess), but these seemed to me to be no more than the differences which might be expected in the recollections of separate informants; if anything, they added confidence that the testimonies of Hill and of Umebayashi Isao and Okano Shin were independent (in particular, the presence of the diagonal lines across the board did not seem likely to be a detail that somebody had invented). I therefore reported this new testimony in Variant Chess 55 (front page and page 4) and repeated it in Variant Chess 64 (pages 177-178), making clear that I accepted it as sound. Further apparent confirmation subsequently came to light in the shape of a report that Umebayashi Isao had once visited Cambodia and had bought a book on Cambodian Chess there, and I reported this also in Variant Chess 64 (page 234). However, I was recently told by Yasuji Shimizu, initially through Peter Michaelsen and then directly, that all this appeared to have been founded on misunderstanding. The set photographed was in fact owned by Umebayashi Isao, and was not a survival but a modern reconstruction based on the information in the first edition of the Encyclopedia. Umebayashi Isao knew of no other information about the game, and he obtained the names of the game and of its pieces from a Cambodian dictionary. The descriptions of the game in the various Japanese books were again based on what appeared in the first edition of the Encyclopedia, and it is my conjecture that the difference in the elephant's capturing powers slipped in as a mistranscription or mistranslation somewhere along the way. As for the diagonal lines on the board in the photograph, Yasuji Shimizu told me that the catalogue of an exhibition held in 2002 included a photograph of a board and men for Chator (Malay Chess, 'Main Chator' in the Encyclopedia and the Classified Encyclopedia) owned by Umebayashi Isao since 1999, Chator being another game whose board features diagonal lines, and the identical graining of the wood showed the two boards to have been the same. This catalogue also included some Makruk boards, without diagonal lines, but all these had stepped rims around the outside. He therefore conjectured that when Umebayashi Isao and Okano Shin needed a board for the photograph in their book, which was published in 2000, they found the Makruk boards unsuitable because the rims came too near to the squares for men to be placed on the square corners, and so they used the Chator board. I reported all this in a posting on 2 November, updated on 4 November, acknowledging that what I had written in issues 55 and 64 of Variant Chess appeared to have been wholly misguided, and that we were back to where we were when I was working on the Classified Encyclopedia: the game currently played in Cambodia was Makruk (Thai Chess) with one or two minor variations, the authority for the game described to P. A. Hill in 1969 appeared once more to reduce to a single informant whose statements were at variance with all other known testimony, and what had appeared to be independent confirmation of the existence of this game had in fact all been taken directly or indirectly from what appeared in the first edition of the Encyclopedia. Be it noted that Umebayashi Isao and Okano Shin were in no way to blame for the misunderstanding; a caption under the relevant photograph said 'Re-creation', and had I been able to read Japanese I would have realised this. It then occurred to me to ask a question which might have been asked earlier: do the 'Hill' rules as given by Gollon produce a playable game? These rules can be found in the Encyclopedia and the Classified Encyclopedia and also in issue 55 of Variant Chess (downloadable via 'BESN and VC' alongside), but for present purposes the following summary is sufficient: the board is 9x9, the men are King, Rook, and Knight with their ordinary chess moves, Elephant and Official, whose moves are subsets of the king's move, and Fish, which moves and captures one step forward until it reaches the sixth rank, when it gains additional powers, and the initial array is RNEOKOENR (shades of Xiangqi!) with 9xF on the fourth rank. There is a diagram showing the initial setup on the front page of Variant Chess 55. I quickly found that these rules do not produce a playable game, in that Black has a very simple strategy which gives White the choice of accepting a draw by repetition or sacrificing material. All he has to do is to mirror White's moves; for example, if White starts 1 Nc3, Black replies 1...Nc7, and so on. In ordinary chess, White can defeat this by giving check or by capturing the mirror-image man (for example, 1 e4 e5 2 Qh5 Qh4 3 QxQ). Here, no such maneouvre appears to be possible until it is too late. Initially, none of White's pieces can cross his fish line (apart from the knight, which will be immediately captured if it does), so to make progress White must sooner or later advance a fish, and Black's facing fish will simply take it. This will leave White a fish down without apparent compensation, which cannot be good, and Black's men (apart from his extra fish) will still mirror White's so he can continue with the mirroring strategy if he wants to. True, once White has advanced a fish he will be able to bring a piece to the square it has vacated, but this square is now commanded by Black's extra fish, so how will this help him? Suppose 1 Na3 Na7 2 Ke2 Ke8 3 Fc5 Fxc5 4 Nc4, intending to meet 4...Nc6 with 5 Nxd6+ giving check and preventing Black from continuing the mirror play; yes, but why should Black play the mirror move 4...Nc6? He can play 4...Fxc4 instead, and his fish ahead has become a knight ahead. Had the game ever been played at all seriously, this simple non-losing defensive strategy would have come to light. I conclude that not only does the authority for the game reduce to a single informant whose statements are at variance with all other known testimony, but that something must have gone wrong somewhere along the line and in fact no such game existed. Whether the error lay with Hill's Cambodian-born informant, who had perhaps seen makruk played in childhood but had never played it himself and had misremembered the details, or whether Hill himself did not properly understand what he was being told, or whether Hill and Gollon got their lines crossed, we can only guess. I don't know how the U.S. military obtained its Vietnamese-speaking interrogators, but I suspect that it took the best linguists among its draftees, sent them on a crash course in Vietnamese, and set them to work, and that their knowledge of the language was often little more than was needed for the purposes of military interrogation. But unless Hill or his informant reads this and comes forward, we shall never know. My thanks to Jean-Louis Cazaux for trying out this strategy against the Zillions implementation of the game, and verifying that the computer (which won't have thrown a fish away unless it could see compensation within its look-ahead horizon) did indeed give up and concede the draw.